Foxes has previewed her upcoming sophomore album online. The official sampler for “All I Need” – featuring singles “Body Talk,” “Feet Don’t Fail Me Now,” “Better Love” and “Amazing” – has been posted to the British singer/songwriter’s YouTube channel on Tuesday (January 05, 2016). “All I Need” is scheduled to hit stores and online outlets on February 5 through Sign of the Times Records (UK) and RCA Records (US). The follow-up to 2014’s “Glorious” delivers contributions from Babyface (Madonna), Kid Harpoon (Rihanna), Dan Wilson (Adele), Jim Eliot (Olly Murs), Rick Nowels (Craig David), and Jonny Lattimer (Ella Eyre). Listen to official sampler for “All I Need” below. Foxes has shared the artwork for her upcoming sophomore album. The British singer/songwriter – real name Louisa Allen – is scheduled to release “All I Need” on February 5, 2016 through Sign of the Times Records (UK) and RCA Records (US). Current single “Amazing” – out now via iTunes – was co-written by Jonny Lattimer (Kwabs, Sinead Harnett), James Newman (Rudimental, Ella Eyre), and Martin Brammer (Olly Murs, James Bay). Other album contributors include Rick Nowels (Craig David), Jonas Quant (Leona Lewis), Babyface (Mariah Carey), Jim Eliot (Kylie Minogue), Kid Harpoon (Jessie Ware), and Jesse Shatkin (Kelly Clarkson). Foxes has premiered the music video for her new single online. The British singer/songwriter – real name Louisa Allen – posted the visual clip for “Amazing” to her Vevo channel on Thursday (December 17, 2015). “Amazing” – now available for download via iTunes (UK) – was co-written by Jonny Lattimer (Kwabs, Ellie Goulding), James Newman (Mollie King, Little Mix), and Martin Brammer (Olly Murs, James Bay). 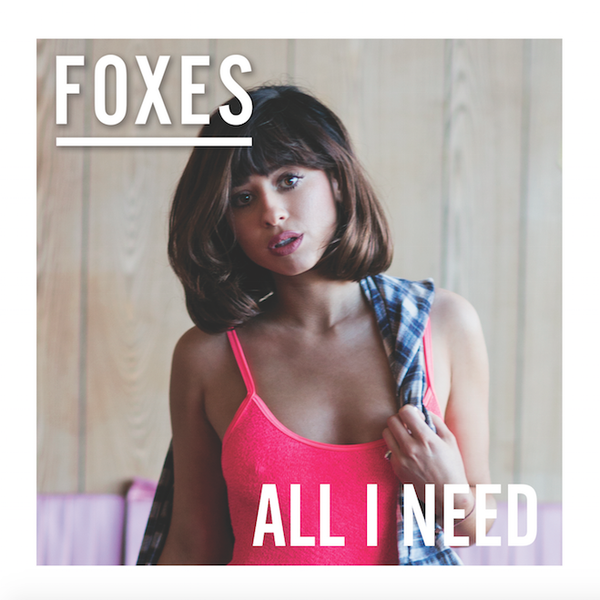 Foxes’ next studio collection “All I Need” – featuring previous singles “Body Talk,” “Better Love” and “Feet Don’t Fail Me Now” – will hit stores on February 5 through Sign of the Times Records (UK) and RCA Records (US). The follow-up to 2014’s “Glorious” boasts further contributions from Babyface (Toni Braxton), Rick Nowels (Nelly Furtado), Jesse Shatkin (Kelly Clarkson), Kid Harpoon (Jessie Ware), and Jim Eliot (Leona Lewis). Foxes has shared a new music video online. The singer/songwriter – real name Louisa Allen – posted the visual clip for “If You Leave Me Now” to her Vevo channel on Wednesday (December 02, 2015). “If You Leave Me Now” was co-written and produced by regular collaborator Jim Elliot, who recently worked with Leona Lewis (“Power”), Ellie Goulding (“Scream it Out”), and Will Young (“Love Revolution”). As mentioned in earlier posts, Foxes is scheduled to release her second album “All I Need” – featuring singles “Body Talk” and “Better Love” – on February 5 through Sign of the Times Records (UK) and RCA Records (US). The follow-up to 2014’s “Glorious” boasts additional alliances with Rick Nowels (Sia), Babyface (Madonna), Kid Harpoon (Shakira), Jonny Lattimer (Kwabs), Dan Wilson (Adele), and Jesse Shatkin (Santigold). Watch the music video for “If You Leave Me Now” below. Foxes has confirmed the details for her new single. “Amazing” – available for download from December 4 via iTunes (UK) – was co-written by Jonny Lattimer (Kwabs, Ellie Goulding), James Newman (Mollie King, Little Mix) and Martin Brammer (Olly Murs, James Bay). The follow-up to 2014’s “Glorious” boasts further contributions from Babyface (Madonna), Rick Nowels (Lana Del Rey), Jesse Shatkin (Sia), Kid Harpoon (Florence Welch) and Jim Eliot (Emeli Sande).